It has been CRAZY hot lately, so we took advantage of the scorching sun this past weekend and made a solar oven. The best part is that we already had all the supplies on hand. The base of the project was a couple of personal size pizza boxes I saved in my craft stash just for this project. The boys loved making and decorating their own personal solar ovens but a big pizza box would work too. This project is fairly easy and older kids can do most of the steps themselves. Just have an adult use a craft knife or scissors to cut the solar oven door. 1) Cut the “oven door” flap on the box. The size depends on what you are cooking and how much access you need. Our door was large to maximize our s’mores capacity! 2) Decorate your solar oven with sharpies. This is a fun *optional* step. 3) Glue black construction paper to the bottom of the box. The black color absorbs the heat. 4) Glue aluminum foil to the inside of the door. The foil reflects the sun into the oven. 5) Tape the plastic over the opening of the door. This will allow the air inside the box to heat up but keep the heat trapped inside the box. 6) Add a graham cracker, marshmallow, and chocolate inside the oven. 6) Place your oven outside in the sun. I taped a wooden skewer to prop the lid open at an ideal angle. The chocolate naturally started melting quickly. So our indicator was the marshmallows, we waited until they had puffed up from the heat. It took about 90 minutes to bake our s’mores. When making these in less extreme temperatures, we just waited until the chocolate melted and called it good enough. This project was easy, a lot of fun and perfect for preschool through middle school. Older kids could design their own boxes, or conduct scientific experiments by varying factors like the box size, oven door size, construction paper color, cooking time, outside temperature, etc. We talked about what was happening while we waited for the s’mores to bake. Have you made a DIY solar oven before? Seriously, this is genius! I am so going to try this out next week with the kids! Learning and s’mores? Can’t go wrong with that!! Much better than using a flame, too. That is the coolest thing I have ever seen for not only making S’mores, but put education into it too, awesome! I had never heard of this! What a great idea! I will tuck this away for next summer, brilliant!!!! This is so super cool – I love it! 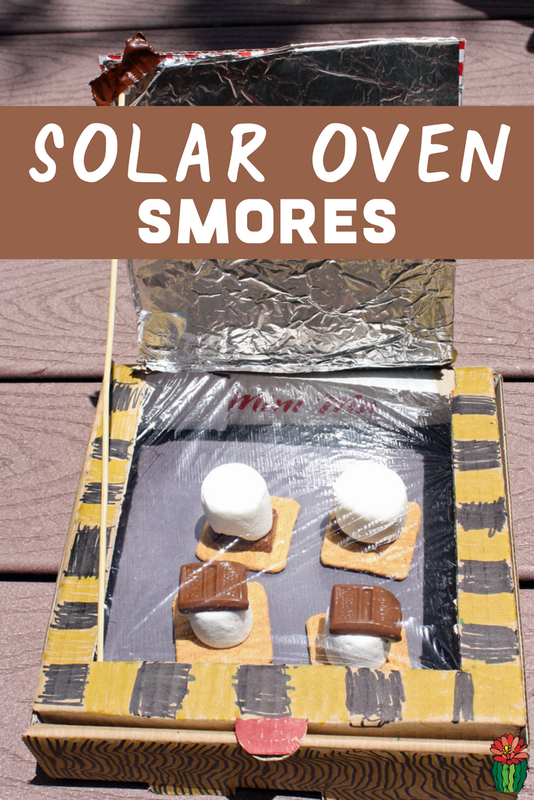 What a fun way to incorporate learning into a fun activity… and even better with yummy Smores! yep in our class were bout to make smores in our solar oven its going to be cool. This is really cool! I would have never thought about something like this. Food and science equals fun! Great idea! Yum!!! My boys would LOVE this!!!! Oh, this is fantastic! And your ‘feasting’ pictures are the cutest. Thanks for a great idea! Do pizza boxes work well for this? Or are cereal boxes better? My son’s class is doing these soon. Thank you! I think cereal boxes would work better. I’d love to hear how they turn out for your son’s class! How did you keep ants and flying insects out? We don’t really have a big bug problem here in Arizona, so there was never any problems with that. The plastic wrap does keep anything out that would randomly fly by accidently. Worked great- we did jourals to explain the experiment! Sun was 105° needed coffee cups to keep oven from blowing in the wind! Will use cereal box vs pizza box next time. Great idea for next time! Awesome! Great job on your project.